We did it. We launched. We drove Robbie out of Jaisalmer and down a long desert road to Barmer. We encountered camels, cows, sheep, goats, dogs, donkeys and peacocks on our way, mostly meandering in the middle of the road, but occasionally leaping out of thorn bushes just to keep us on our toes. We stopped every hour to let Robbie’s hot bottom cool down. We ate out-of-date crisps. We entertained the locals. We got lost in Barmer and discovered that when an Indian says ‘straight straight’, he actually means ‘You’ve gone too far. Turn around and cross 3 roundabouts. At the 4th, take the 2nd exit. Do a u-turn underneath the half-finished fly-over. Come back round the 4th roundabout and it’s on your left. And be careful of the section where the road is crumbling away. ‘ We’re now safely installed in the Hotel Maraudhra Palace (funny looking palace). And there’s free Wifi. Tomorrow’s another day. By way of explanation, funnels are very important for rickshaw drivers as they allow you to fill the tank from a jerry can. And as a rickshaw’s range on a tank of fuel can be anything from 100-200km, depending on all number of unknown factors including Krishna’s mood, Ganesh’s breakfast and the whim of Shiva, finding ours had been stolen overnight was deeply concerning. 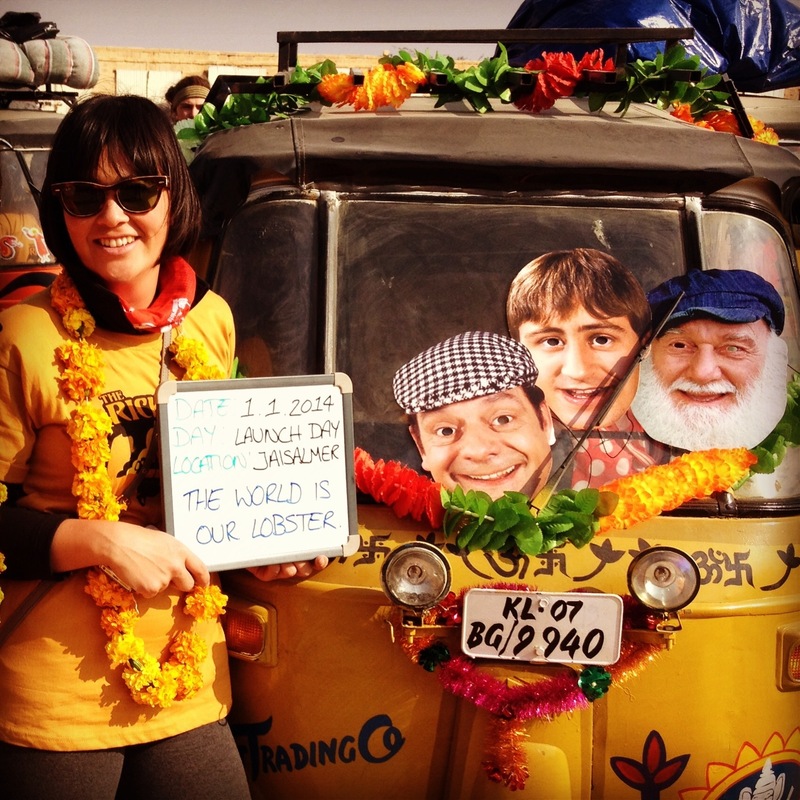 Cue posing this question to several of our fellow Rickshaw Runners. No, not that funnel, thank you. After 9 months of planning and fundraising, a long journey to Jaisalmer and several days of preparations, pimping and test driving, we boarded our little Robbie, crossed under the start line and we were off. It was actually happening. We guided our trusty ‘shaw through the chaos of Jaisalmer, as other road users – 2 and 4 legged and motorised – appeared to dive intentionally in our path from every direction. It was terrifying. We were awesome. We bloody did it. Nothing could stand between us and the open road. Now only 13 more days and 3350km to go. 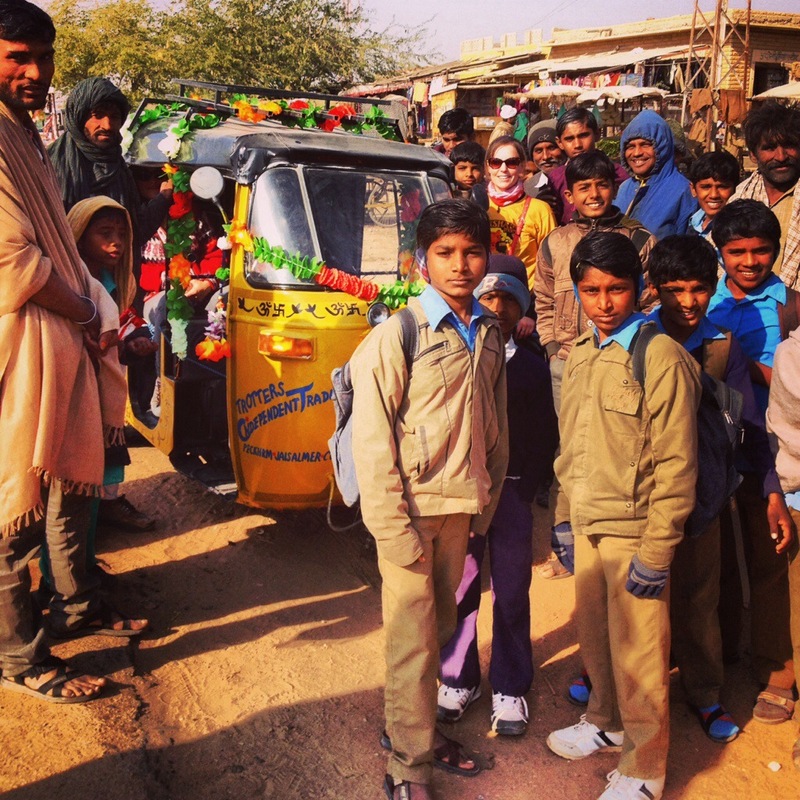 Our Mob of the Day has to be our first mob of the Rickshaw Run, of course. 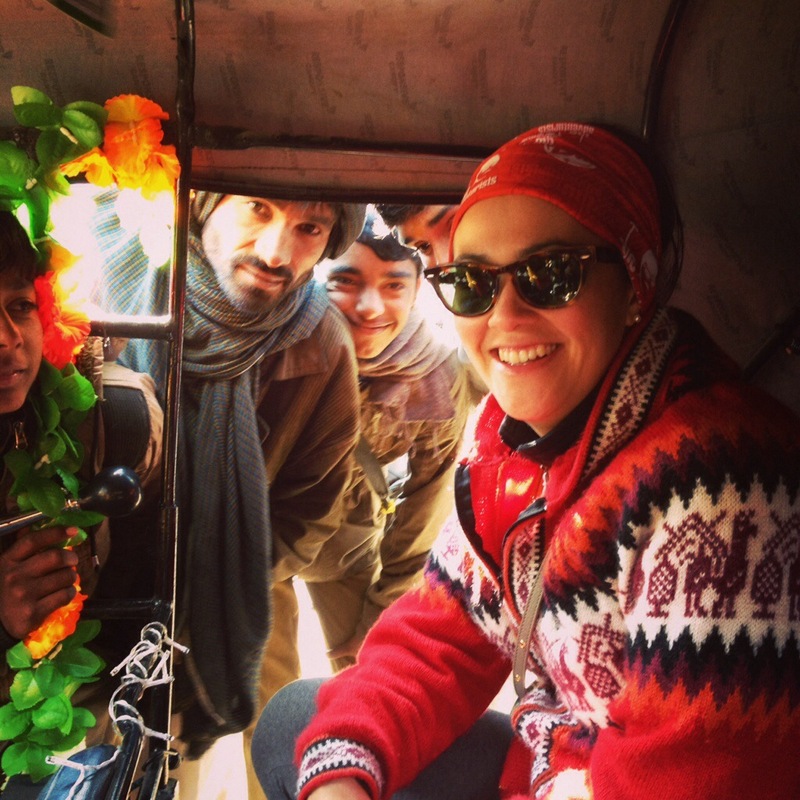 As an all-girl team driving a delciously-pimped rickshaw across India, we tend to attract a lot of attention. The very sight of us seems to whip the Indian general public into a state of frenzy, which reaches its peak when we pull over to the roadside in some one-horse town for a scooby snack break/to buy some water/to mend Robbie. In this case, we stopped as our horn had stopped working some several kilometres back. Yes, Robbie had lost his rather shrill voice. Now permit us a brief divergence. A horn is almost a better friend to a rickshaw driver than a funnel. In India it’s quite acceptable – neigh recommended – for you to sound your horn at every given opportunity: to warn a person, beast or motor vehicle that you’re passing; to warn a person, beast or motor vehicle that you’re not passing; to say hello; to say goodbye; to indicate that you’re setting off; to indicate that you’re pulling over; just because you like the sound; even if you don’t like the sound, just because you can. You catch our drift. The sound of vehicle horns is the sound of India. So, we pulled over as our horn had stopped working. A huge crowd of Indian men swelled around us. They all had an opinion on the rickshaw, our stereo, our decorations, our Christmas lights and the location of the nearest mechanic. None knew how to fix the horn. Until…one onlooker decided to bash Robbie’s nose and miracle of miracles, by George, he did it. Robbie had his squeak back again. And the excitement level of the crowd reached such heights not seen since Tendulkar’s retirement. ERRRrrRrrRicAAaAaAAAA! Get back here now. You crazy. ps – i see your little face in that pic above – ahhhh FUZZ on tour. PS – great blog, proper sentences and everyfing!